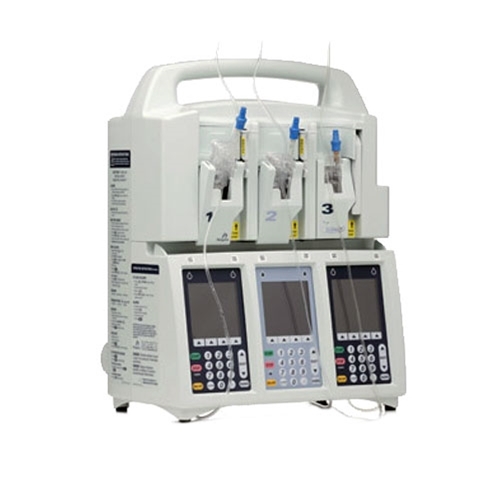 The Plum A+3 Infusion System with Hospira MedNet Software is a single unit that allows clinicians to manage an industry-leading six-infusion line medication management system throughout the continuum of care. The wireless-enabled system assists healthcare professionals to better manage the complex medication dosing regimens typically seen in emergency rooms (ERs), intensive care units (ICUs) and oncology centers. Patients in these settings are often critically ill and may require multiple drug infusions delivered at precise doses and on varying schedules. The Plum A+3 with Hospira MedNet Software enables clinicians to deliver these infusions either simultaneously or in specific tiered sequences, depending on each patient’s needs.